You’ve seen it virtually every day as you walk to and from class. You comment about its new designs with your friends and professors. You may have even helped spray the latest design onto its surface, leaving behind leftover cans of spray-paint for no explainable reason. Yes, no matter what you do on campus, you are, without a doubt, well acquainted with “The Rock.” It’s the pride and joy of Albion College. This unbridled symbol of individuality and creativity has dominated every aspect of life for the typical Albion College student for generations. 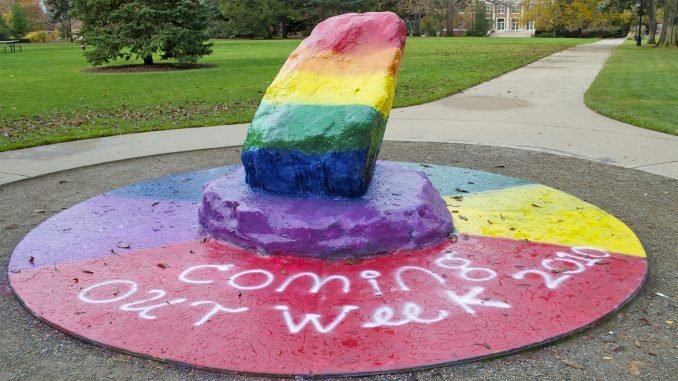 However, with all of the eons of adding layers of paint to “The Rock,” it soon came into question how much of this large epic representation of personal freedom was actually a rock. The resulting study proved conclusively that there is in fact no part of “The Rock” that is actually rock. The entirety of this now false idol is one solid ball of solidified and compacted paint. When faced with this blatant contradiction to all that they’ve ever known and believed, the student body has responded with outrage. With the foundation of their very existence crippled beyond repair, students of the college may never fully recover. The loss of one of the few things that they’ve held to be constant in their lives has for certain left a deep wound in their hearts. However, with the end of the semester drawing near, it is hoped that morale will be restored in time for commencement.